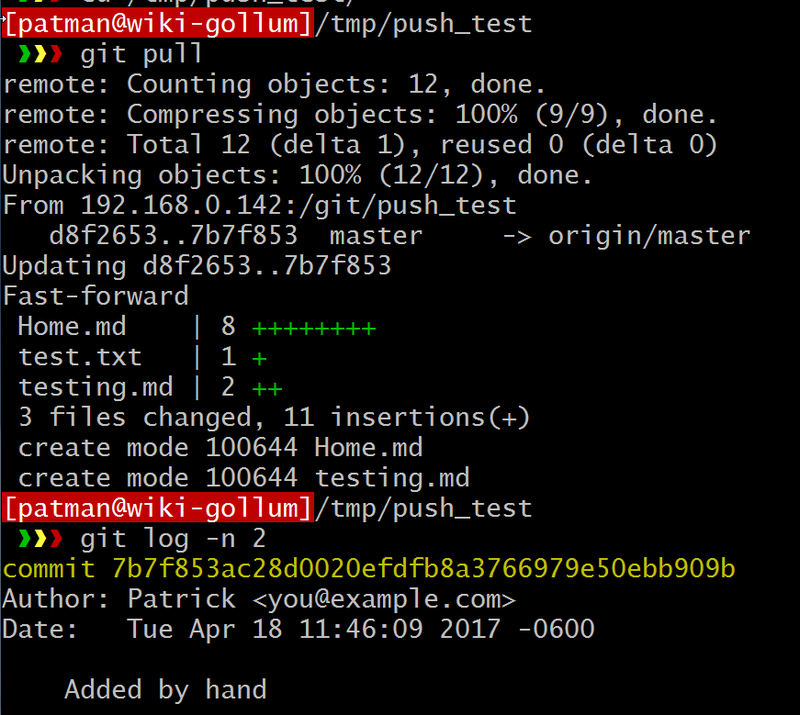 One thing I really need to add to my Gollum install is the ability to auto sync with a remote git repository. In this article I am going to go over a simple way to do that using git hooks. In the end every Gollum commits a change it will push that change up to the remote repo. Also, every time another repo pushes a change to the same remote repo it will run another hook that will cause Gollum to run a git pull locally. First a quick lesson in git hooks! It's been a long time since I even fiddled with git hooks and I am by no means a master. So it's probably a good idea to set up a test. So as a test let me first set up a git repo and a remote git repo to push to. 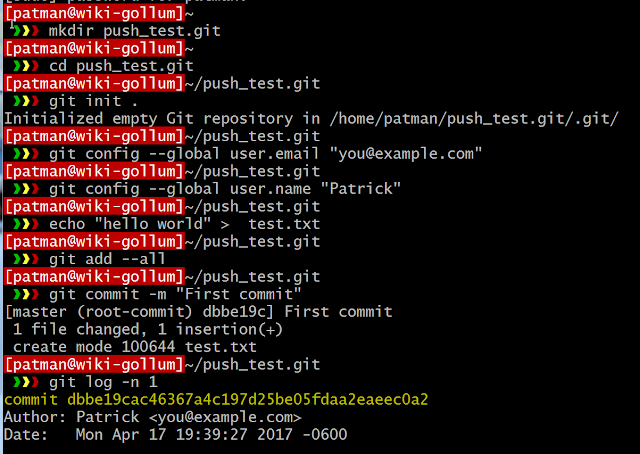 > git config --global user.email "you@example.com"
> git config --global user.name "Patrick"
If you are reading this article I am assuming you have a remote git repo set up and good to go. But just in case you don't, and to help me the next time I do this, I am going to set up a git remote repository on an Ubuntu 16.04 server I have. You will see that you cannot do it, you need to specify the shell since we set the git-shell as the default. Now go make a bare repo. One last thing to set up on the git remote server, the ssh keys! SSH public keys need to be added to the git users .ssh/authorized_keys file. The connection succeeds, but it also fails to login because it uses the git-shell which will not allow git to login via ssh. But, it will allow it to push git changes to it via the ssh protocols. 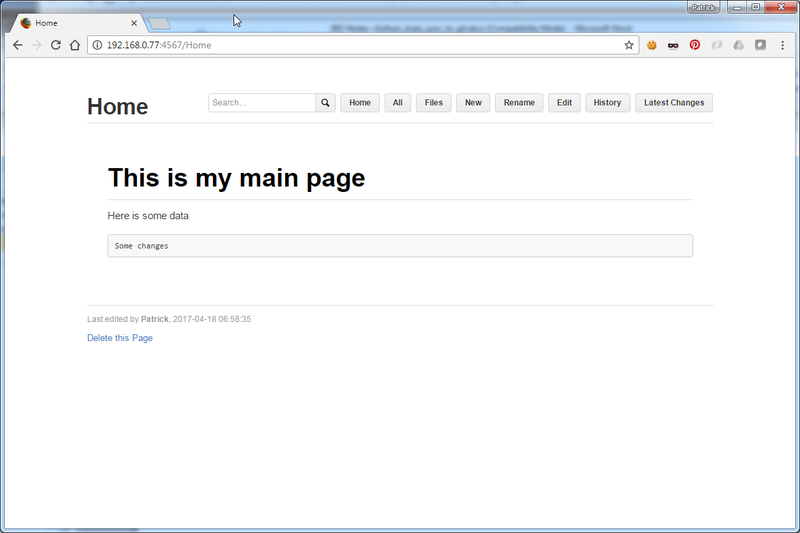 Now it should be ready to be pushed to from my gollum server. 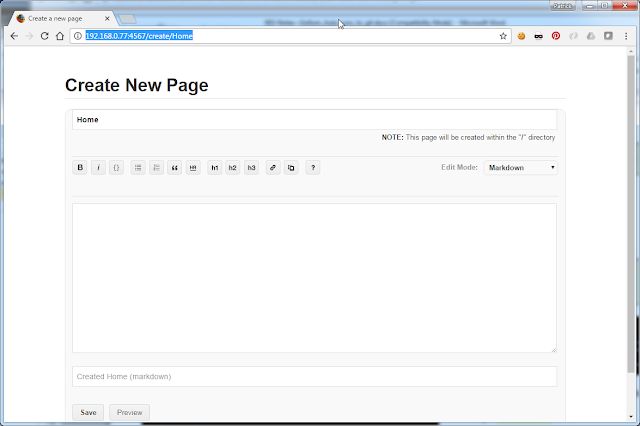 I prefer to set my upstream so that I do not need to designate the remote repository when I do a push. This command will do that. Now that I have it all connected, how can I get the wiki to auto push up to the remote repo on changes? 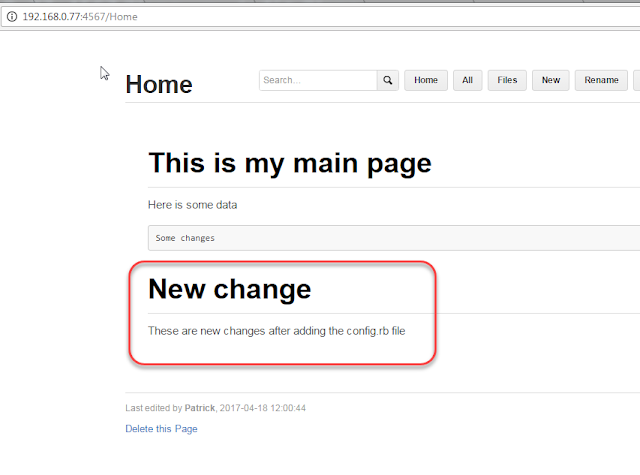 Create a post-commit hook that will run after a local commit has been completed. I made a few pages and edited them a few times. 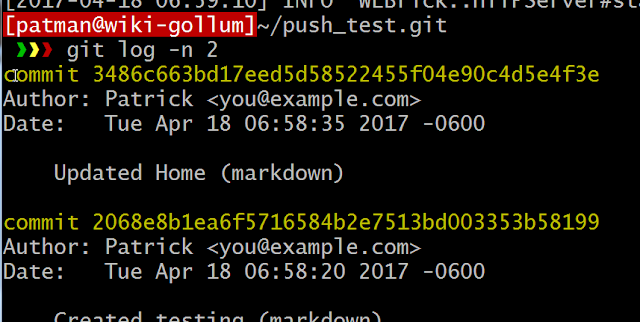 I believe the hook is good but there is an issue with how gollum's git tool. 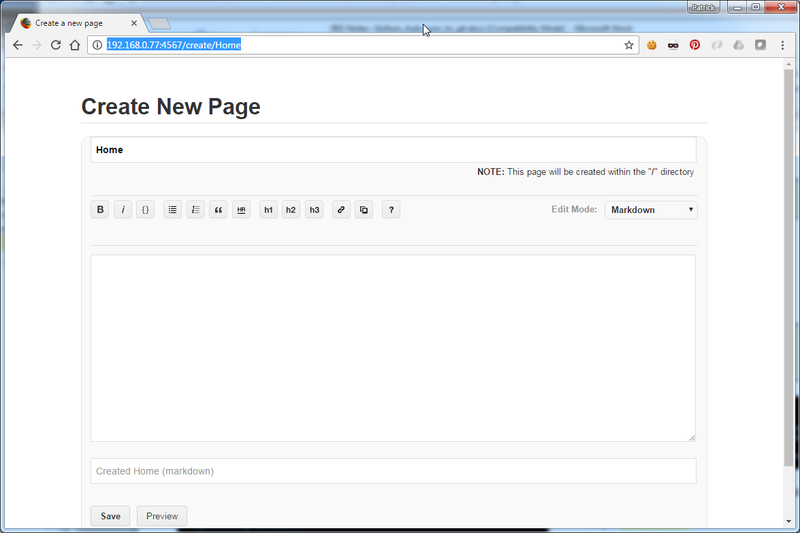 To prove this out let me go back to the original repo and hand edit a file and check it in. 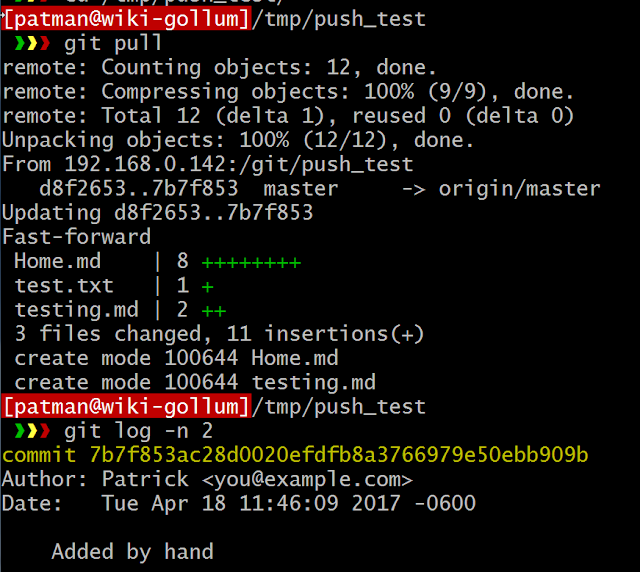 > git commit -m "Added by hand"
Now go to the repo that was cloned in the /tmp directory and pull it. That worked just fine. So the hook is fine! Gollum's implementation of git is lacking. K00P at the bottom has a suggestion on how to fix it. I am going to try and implement that fix. Now start gollum, but use the --config option to load this file. 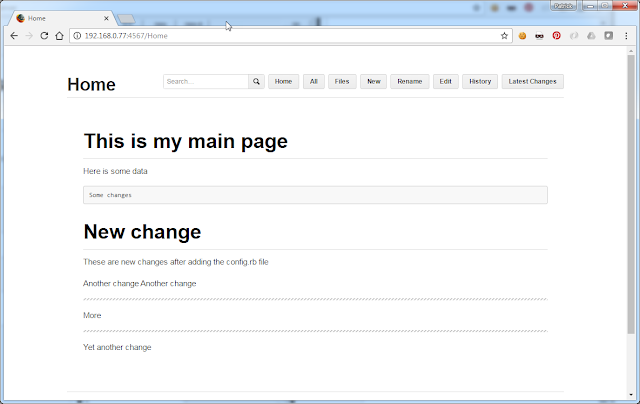 Now open the wiki page and edit a page. 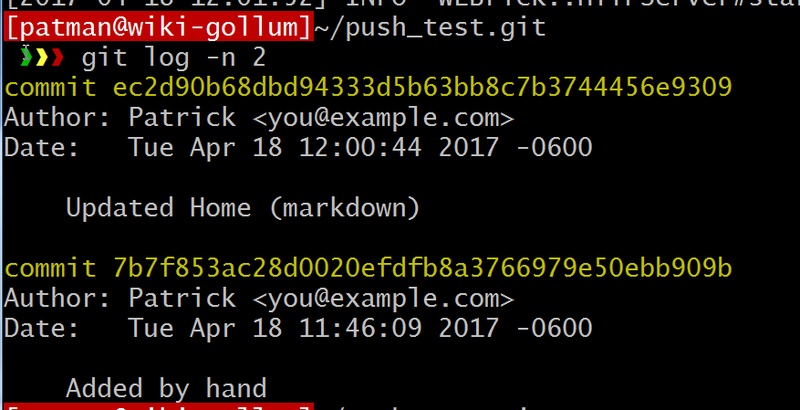 How do I get Gollum to auto pull from the remote repo? I will not use this often, but there are times when I do pull down a git wiki repo and add small images to it and then push it up. 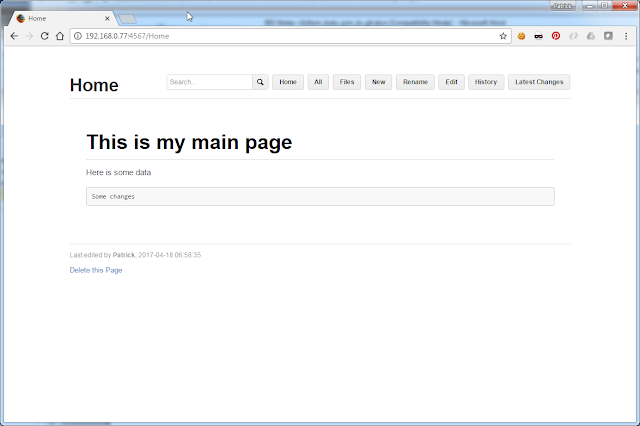 I am not too fond of that idea, but it does take away the need to have a config.rb file. My other choice is to set up a custom hook on my remote git server that will force my gollum git to run a pull. 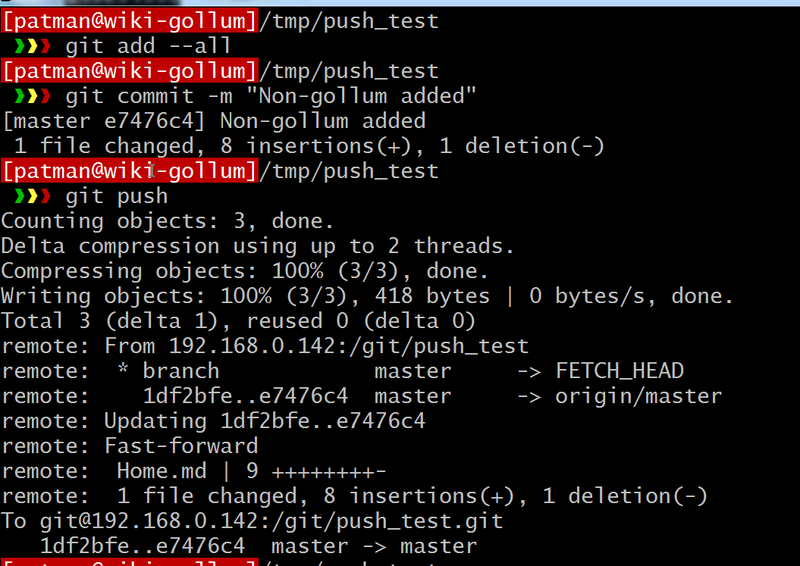 First I need to make sure I can ssh from my git server as the git user to my gollum server. Login the git server and switch to the git user and obtain the public ssh key. 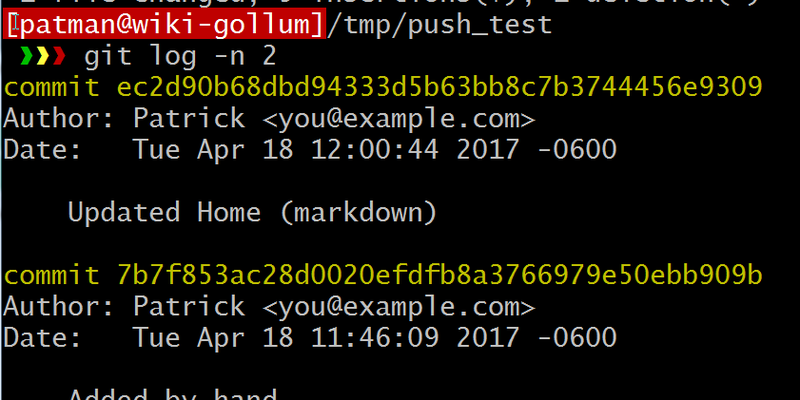 Copy that into the ~/.ssh/authorized_keys on the gollum server. 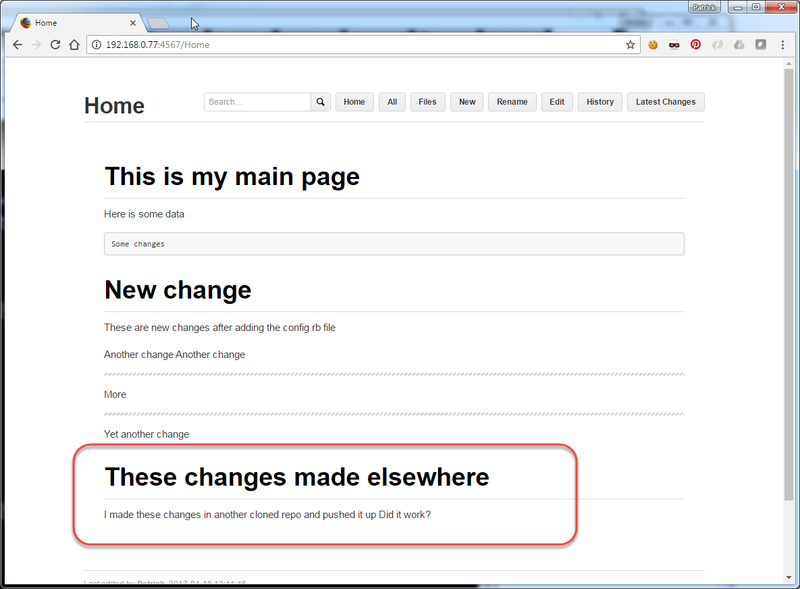 In the git server head over to the base of the git repo you want to add the hook to. Now in theory when a change is made on gollum and commited it will auto push the code to the remote repo which will then run this hook upon completion. This hook will run but nothing should be done because the local SHA and SHA on the gollum server will be equal. But if I push a change up from another location to the remote repo it should force gollum to pull down the changes. Let's see if it works. ..
First make a change in Gollum from the wiki page. Just to make sure I did not break anything. Both are identical so the auto-pushing is working. Add some text and save it. Add it, commit it and push it up. > git commit -m "Non-gollum added"
This was super helpful! Thank you so much for documenting this process so clearly, especially for including your full process. I set up a Gollum instance at work for some internal documentation, and this helped me set up an automatic backup of it to a private Bitbucket repository. I linked to this article from an article in my Gollum instance, but it's on a private server.